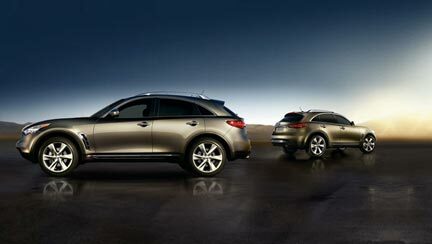 The powerful Infiniti FX, Infiniti"s iconic performance crossover, enters the 2011 model year with a few important enhancements - including standard power rear liftgate (late availability) and one new exterior color. FX is again available with a choice of a 390-horsepower 5.0-liter 32-valve DOHC V8 engine with VVEL (Variable Valve Event & Lift) or with a 303-horsepower 3.5-liter 24-valve DOHC V6. Both engines are paired with a standard 7-speed automatic transmission featuring Adaptive Shift Control (ASC) and available solid magnesium paddle shifters.